George H. W. Bush ushered in the end of conservatism and the destruction of the Republican Party. His most famous line as president, was “Rea my lips. No New Taxes.” He then proceeded to raise taxes and paved the way for Bill Clinton to come into office. 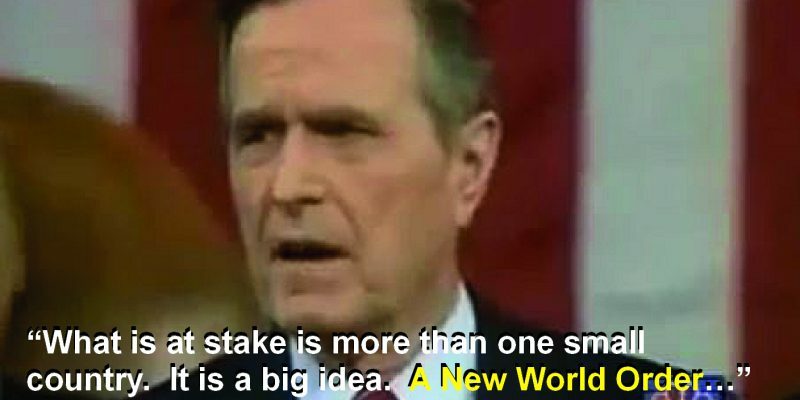 George H. W. Bush promoted the New World Order more than 200 times when he was president. His goal was for the United Nations to govern the order. His first declaration of this order was on September 11, 1990 and again in January 1991 during his State of the Union speech. Part of this New World Order was unconstitutionally waging war against other countries. President Bush and Secretary of State Baker pushed a series of resolutions through the United Nations Security Council condemning Iraq; demanding Iraq’s withdrawal from Kuwait; and authorizing the use of force to eject Iraq from Kuwait. On the basis of these UN resolutions, 661 through 665, President Bush sent 450,000 U.S. troops to Saudi Arabia – without authorization from Congress. The United States has never had a defense treaty, ratified by the Senate, with either Saudi Arabia or Kuwait. An Executive Order by President Carter -the Carter Doctrine – had placed the entire Persian Gulf within the United States Defense Perimeter. Now, still without a treaty or any form of Congressional authorization, the U.S. has permanent military bases in Saudi Arabia and Egypt. Waging war through the CIA was an every day objective of the then CIA director Bush, whose colleagues and mentors were groomed through the same cult at Yale: the Order of Skull and Bones. Not to mention his father, Prescott Bush, who helped Nazi Germany rise to power. His financial gains were unfrozen by the Treasury Department decades later, which helped fund George H. W. Bush’s first congressional campaign. A more comprehensive overview of Skull and Bones and the New World Order is explained in the unauthorized biography of George H. W. Bush by Webster Tarpley and Anton Chaitkin.